Want to learn how to keep your beloved pets safe in the event of a fire? Our partners from Protect America have some helpful tips for you! House fires are disastrous and dangerous. Fires can grow and spread very quickly, causing serious damage to a house in a short period of time. The heat and smoke can be harmful and deadly to both humans and pets. Every year, about 40,000 pets die in house fires. Fires are even started by pets about 1,000 times a year. Many house fires are easily preventable, and there are many preparatory safety measures to ensure that our pets have a chance to make it out safely in the event of a fire. The best thing you can do for your home, your pets, and your own safety is to put conscious efforts into preventing fires in the first place. This places every household member out of harm’s way and is not only easier but also cheaper than dealing with the aftermath of a house fire. You should never leave open flames unsupervised, but this is especially important if you have a pet who can knock things over or pass their tail through the fire. Consider using flameless candles or other electronic alternatives. Discourage your pets from playing around in the kitchen. There are many hazards here including sharp objects, open flames if you have a gas range, and dangerously hot surfaces. Some pets (especially cats) tend to be curious about surfaces and knobs. Prevent possible fires started by stove knobs turned on by pets by placing an inexpensive stove knob cover whenever you are not using the kitchen. Go through your home and make sure that any electric wiring is tucked away and inaccessible by any pets or children. Any exposed cords that you are using to power your appliances should be neatly secured and placed out of pathways. Curious pets can get tangled in messy cords, and some animals (particularly rabbits and cats) may try to chew through them. If you leave food or water bowls outside on a wooden deck, don’t use glass. Glass bowls can create a magnifying effect, starting a fire from the sun’s rays. Ceramic bowls are safer and just as sturdy. Unfortunately, some fires can not be prevented. Here are some ways that you can prepare your pets for the worst case scenarios. Place a window cling on all entry doors or windows notifying firefighters that there are pets inside. Detail how many pets you have and what kind of animals they are. This will inform the firefighters of their presence even if you are not home. Every household should already have an emergency plan for their members so that everyone knows how to get out and where to meet. Include your pets in this equation, designating specific people to be in charge of specific pets so that as many people and animals get out alive as possible. 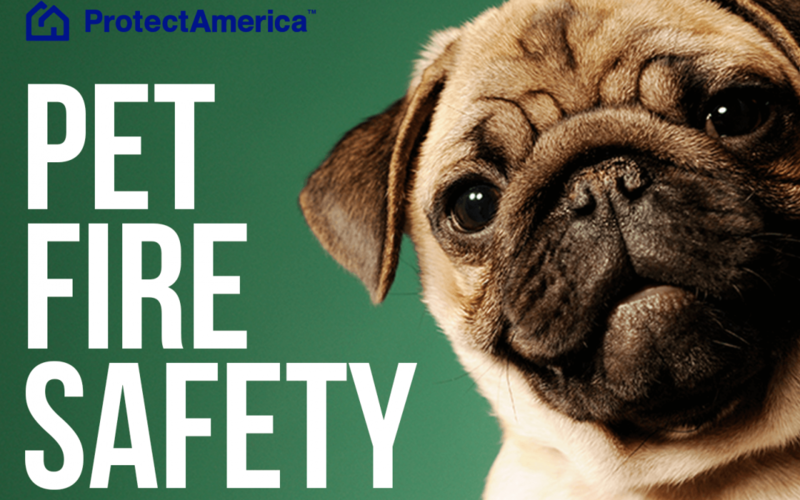 Using monitored smoke detectors is absolutely crucial if your home includes pets. Traditional smoke detectors will only sound an alarm when fire is detected; it will not notify you or the local authorities. When your house is on fire, every second counts; the smoke, heat, and flames threaten the wellbeing of any person or animal inside. Monitored smoke detectors alert you and the local authorities. Young animals should be restricted to a safe, enclosed space. This makes them easy to locate and also protects them from getting into hazardous and dangerous situations. If your pet is able to wear a collar, make sure that their name and your contact information is on the collar or tag. If your pet is able to be microchipped, keep the chip updated and registered. These steps will increase your chances of being reunited with your companions if you are separated during the fire. Creating and maintaining an emergency supply kit will really make a big difference in the case of any emergency evacuation. Keep these kits in easily portable containers or bags, and place them near exits, where they will be easy to grab and go. Keep perishable items like food and medication updated so that you aren’t left with expired goods during an emergency. In the event of a fire, stay calm. Evaluate the situation. If the fire is still relatively small, grab a fire extinguisher and aim it at the base of the flames. If the fire is out of control, decide what exit paths are still safe and available. If you can reach your pet through that exit path, bring them with you as you leave the house. Grab your emergency kit, too, if there is one near your exit. However, if you cannot find or reach your pet through a safe exit route, prioritize your own safety by getting out of the house. Let professionals take care of the house and rescue. If you have already evacuated, tell firefighters what animals are inside and where they can be found. Once rescued, keep your pets close by and within your sight so they don’t get lost. If you will be relocated or out of your home for an extended period of time, take your pet to an appropriate place for them to stay and be reliably cared for during this time.